K. E. Piquette and R. D. Whitehouse (eds. ), Writing as Material Practice: Substance, surface and medium, Ubiquity Press, London 2013. The book is fully downloadable in various formats via Ubiquity Press website. Writing and the art of writing in the field of Islamic studies has always enjoyed a special place: Arabic calligraphy is fascinating and inscriptions and their contents have been thoroughly examined, even if there’s work still to be done in some fields. The new book edited by Kathryn Piquette and Ruth Whitehouse, even if does not take into consideration specifically Islamic and Arabic inscriptions, can help developing this branch of Islamic studies, opening new research perspectives and posing interesting and challenging questions. [a] disciplinary division […] in which the philologists – often brought in by archaeologists as technical experts whose interpretations are hard to challenge – have had the upper hand. This has led to an emphasis on the content of inscriptions and other writing […]. These studies not only neglect materiality […], but they also tend to neglect context. The material in which the text is written is not merely a support, but is constitutive of the meanings of the text. Moreover, writing is defined as an individual and collective practice, deeply rooted in the social structure of the period of production. Thus, the authors propose a new way of looking and of studying texts, taking into consideration other aspects together with content: writing seen as a product of the period, the material used for the support influencing the writing, which leads to considering writing as an artefact, and writing as practice, i. e. the text as process and as outcome. This perspective also involves a reconsideration of the roles of writers and of readers, together with the time, the space and the modes of perception of the written text. The book and the topic it covers is of course not restricted in term of space and time: the assumptions on which it is based can be applicable to a variety of contexts and this is clearly visible in the variety of topic the numerous contributions are about. The same challenging perspective that in the contributions is applied for Minoan writings, Egyptian hieroglyphics,Etruscan scripts and so on… can be applied, and I dare say needs to be applied, also to the study of Arabic and Islamic calligraphy. I must admit that I also kind of expected a chapter on Islamic inscriptions… but it’s not the case (and maybe I am too narrow-minded and concentrate on this topic…). As Piquette and Whitehouse write “research [on the topic] has been intermittent and dispersed” and, on the other hand, “interest in the materiality of writing is more developed in some fields than others”. When reading parts of the book, some interesting articles written by some important scholars in the field of Islamic inscriptions popped-up in my mind: I well remember how OlegGrabar, in his “Graffiti or Proclamation: why write on buildings?” discussed the contextual functions of the inscriptions on monuments, or how Ettinghausen and Hillenbrand concentrated on the role of the readers and the actual reception of the texts inscribed on monuments. Thackston went somehow further, discussing the readability vs the legibility of the text: he maintained that every text is to be considered legible (in the sense that it can be deciphered) but not all of them are readable (in the sense that a reader cannot actually see and read them). Tabbaa, in two articles [1–2], underlined how the calligraphic style was meaningful to the define some unexpressed meaning of the text. From the perspective of Piquette and Whitehouse, only few aspects of “writing as a material practice” have been taken into account when dealing with Islamic inscriptions: the role of the writing in context (writing as a product of the period) and the roles of the writer and of the reader (writing as process and outcome). Also, these two aspects seem to have been debated mostly on a theoretical point of view and, as far as I know, when reading inscriptions or texts the attention is on the contents of the inscription, and not on the materiality of the writing. This book, and the approach it proposes surely would help in studying Islamic inscriptions and the role of the public text, better defining the material culture involved in the textual production. R. Ettinghausen, “Arabic Epigraphy: communication or symbolic affirmation”, in D. K. Kouymjian (ed. 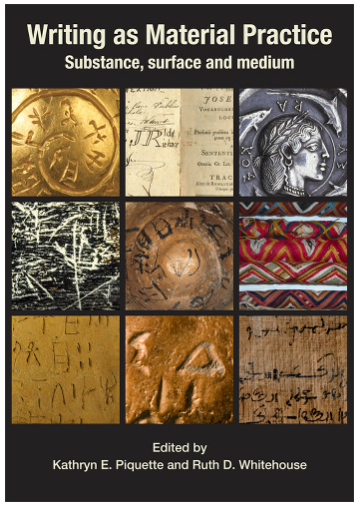 ), Near Eastern numismatics, iconography, epigraphy and history, American University of Beirut, Beirut 1974, pp. 297-317. O. Grabar, “Graffiti or Proclamations: Why Write on Buildings?”, in D. Behrens-Abouseif (ed. ), The Cairo Heritage, Cairo 2000, pp. 69-75. R. Hillenbrand, “Qur’anic epigraphy in Medieval Islamic architecture”, in Revue des études islamiques, 54 (1986), pp. 171-187. Y. Tabbaa, “The transformation of Arabic writing: part 1, Qur’anic calligraphy”, in Ars Orientalis, 21 (1991), pp. 119-148. Y. Tabbaa, “The transformation of Arabic writing: part 2, the public text”, in Ars Orientalis, 24 (1994), pp. 119-147. W. M. Thackston, “The role of calligraphy”, in M. Frishman e H. U. Khan (eds. ), The Mosque: History, Architectural Development & Regional Diversity, Thames and Hudson, London 1994, pp. 43-53. I will certainly chase this up. I raised the issue of translating epigraphy/inscriptions on islamic objects in British museums in my PhD, and the abridged version (“The Representation of Islam in British Museums” (2007). BAR S1643 British Archaeological Reports. Archaeopress, Oxford.) is still available. be keen to hear your thoughts!